David Stern (@davidaaronstern) explains why "Weird" Al Yankovic might be the most important musical artist of all-time. Editor's Note: At the Puddles of Myself Reading on September 7, 2012, David Stern— leader of the New York-based band, the Sanctuaries—held the audience captive as he read a piece detailing why "Weird" Al Yankovic holds more relevance to the human race than any other musician. Now, you can read his argument below. You can also verify out his musical credentials by checking out the EP "Not Guilty," which is the latest release by The Sanctuaries. In a recent interview, Ezra Koenig of Vampire Weekend was asked what it is about music that keeps the audience from separating the art and artist. If we can separate text from an author why can’t we separate a song from the singer? He replied that with pop music, you can never just focus on the song. “When you hear a new Bruce Springsteen song, you know it’s Bruce Springsteen. You picture his history, you picture the way he looks. You know where he’s from, you know his back-story… You know what he stands for.” He continued, “It’s about being a pop artist and that’s your songs, your attitude, the way you look, the way you talk. And that’s kind of just one thing.” And he’s right. A song does not arrive to an audience as a self-contained entity; it is gift-wrapped by the performer’s identity. Because of this, our perception of a song has as much to do with who is singing it as it does with the musical elements of which it is comprised. Nobody talks about “ManicMonday” as being the work of a pop genius; people know it as an old hit song by the Bangles even though it was written by Prince. Relating on a personal level, when I used to hear “One” by Three Dog Night I would scoff at its blue-eyed soul cheesiness and consider it the schlock one should expect from such a schmaltzy band. However, when I later heard original writer Harry Nilsson’s version the song took on a new meaning. I now perceive it with who Nilsson was as a musician and person completely in mind and view it in the context of his sensibilities. Now, there is at least one exception to this rule articulated by Ezra Koenig. There is an arena in which songs by Lady Gaga, Michael Jackson, U2, George Harrison, and Coolio play on the same field. It is an arena in which their personalities and identities are equalized. And it is an arena that helped shape my own eclectic taste and fascination with genre. The arena to which I am referring is the catalog of “Weird Al” Yankovic. It’s easy to run down a list of songs on any given "Weird" Al album to notice how varied the content pool is. In the case of Greatest Hits Volume II, you get musical elements by the Crash Test Dummies, Red Hot Chili Peppers, Nirvana, Billy Ray Cyrus, Dire Straits, Jimmy Webb, and the Kinks, as well as songs in the style of James Taylor, Christmas novelty music, and 1930s vaudeville. This cohabitation of personalities is partially responsible for stripping away image-associations. For how can Kurt Cobain’s selfhood have any value—even in a song whose music was written by him—when it shares a home with an unlikely hodgepodge of other artists whose songs represent such disparate universes? This is especially true when, unlike in the case of a regular multi-artist compilation album, the lyrics of the songs have been comically revamped leaving behind a caricature of the original identity but not the identity itself on any given track. This allows the listener to take each song at face value and to keep the original artist’s persona from infiltrating his or her perception of it. You might be thinking, “of course the original identity is gone. Al changed lyrics of longing, social commentary, freeness of soul, or a life of hard knocks into lyrics about TV, food, going to the dentist, or being Amish.” But I’m focusing on the music which—save for the occasional accordion solo, fart, belch, or other sound effect—remains mostly unchanged. “And what about Al’s identity?” you might ask. “Surely after an over-three-decade career doesn’t his personality come through in the songs?” In my opinion, it does not. With an obligation to parody what is current at a given time, he has hardly a musical sensibility of his own (especially when this covers so many different genres). And, although many of his lyrics are memorable and hilarious, he operates within an ossified realm of family-friendly comedy. Bringing it back to myself, I have never been a fan of Miley Cyrus. She, to me, represents—on second thought, forget trying to explain why I don’t like her. I’m a 26-year-old male who likes Lou Reed too much. Use your imagination. Point is, whenever “Party in the USA” would come on, I would never allow myself to enjoy it for the simple fact that she was tied to it. On a recent car trip, I was making my way through Yankovic’s latest release, 2011’s Alpocalypse, and when the seventh song, “Party in the CIA” blasted off, I was immediately curious as to how I would react. Gone were Miley’s all-too punch-able face, nepotism, and a cloud of teenybopper-dom. Before I knew it, I was nodding my head and thinking about how it was one of the catchiest things I’ve ever heard. I extracted from it pure joy and appreciation and—to be clear—I don’t even think Yankovic’s parody is in the least bit clever or funny. On an album in which songs by Gaga, Taylor Swift, B.o.B., and T.I. received the same treatment regardless of those artists’ varying degrees of commercial and critical success or mass appeal, the song was simply separated from Miley. Another way in which “Weird” Al removes the original artist from a parody is by taking a genre-specific element of the source material and making a general statement about it. Regardless of whether you like “Smells Like Teen Spirit”, when Yankovic obfuscates lyrics about not being able to make out lyrics in “Smells Like Nirvana”, you associate that with grunge in general (think about Adam Sandler’s Eddie Vedder impression here). Regardless of whether you follow Lady Gaga’s red carpet antics or are familiar with her fashion sense, you associate the larger-than-life attention-grabbing nature that is sung about in “Perform This Way” (a parody of “Born This Way”) with divas in general. And regardless of whether you have even heard “Achey Breaky Heart” in the past ten years, Yankovic’s “Achey Breaky Song” reduces the “don’t torture me” perspective that you associate with country-pop and turns it back on the genre itself. But “Weird” Al’s greatest achievements when it comes to genre, in my opinion, come from his original compositions. Even though he is not parodying specific songs, the musical vocabularies used by him and his band perfectly relay the sensibilities of whichever style he is mimicking. “Young Dumb & Ugly” off of Alapalooza, for example, captures perfectly the nitro-injected brand of rock that AC/DC are known for right down to the four-on-the-floor drumming, screeching vocals, and bad-attitude lyrics, the latter of which paint a hilarious caricature (“’Weird’’s still got it! I would exclaim in 1993 after hearing the lines, “Reaisin' hell, bendin' the rules just a little/ We're livin' only for thrills/ We squeeze our tooothpaste tubes from the middle/ And wait until the last minute to pay our telephone bills”.). And this raises an interesting question. To a listener, is there a difference between a “Weird” Al original and a parody of a song unfamiliar to that same listener? If you had never heard “You Got It (The Right Stuff)” by New Kids on the Block, would Al’s ode to the Oreo cookie, “The White Stuff,” just seem like a “style-parody” of late ‘80s/early ‘90s boy-band synthpop? It would. This is because every song uses highly recognizable elements of a genre as the building blocks from which it is made. So, you can recognize what a song is supposed to be doing regardless of how familiar you are with the source material—if there even is any—because, after years of listening to pop music, your ears have been repetitiously trained to discern signifiers of style. When I first heard “Jurassic Park”, also off of Alapalooza, I could hear in it chord progressions, an arrangement, and a melody that suggested that Al was assigning lyrics about this horrific dinosaur playland to what would normally be a song wrought with saccharine sentimentality and melodrama. It wouldn’t be until years later that I would even realize that it was a parody of “MacArthur Park”, a Jimmy Webb song originally recorded by Richard Harris, which was the target of venomous ridicule for containing exactly those things. “Weird” has done it again! 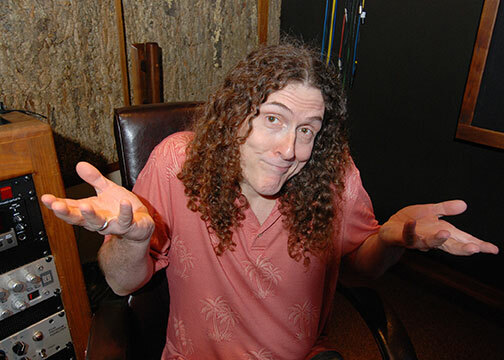 Since the above is true, it makes “Weird” Al Yankovic albums, especially those songs that are not parodies, study material for understanding musical DNA. One can put on any of his tracks, be it “Twister”, a brash ‘80s hip-hop song with a rock drum beat in the style of Licensed to Ill era Beastie Boys, or, my personal favorite, “You Don’t Love Me Anymore”, a singer-songwriter’s take on someone violently—and I mean violently—telling you it’s through, and recognize the characteristics that make them sound like other songs of their respective styles. I’m personally very thankful for “Weird” Al Yankovic. Not just for helping me understand music as a young person, but for also helping me appreciate certain music. As a child I called country music “goat music”. It wasn’t until “Achy Breaky Song”, since it was separated from any one artist’s identity, that I realized I actually liked it. I listened to it over and over again latching onto the goofy lyrics that I adored until I finally liked the musical makeup of the song itself. It was is if I force fed myself food I didn’t like until I got used to its flavor but as painlessly as not even realizing that I didn’t think it tasted good while eating it. People sometimes ask each other, “if you could leave music behind for an alien race to discover long after humans have died off, what would you leave behind?” The Beatles, Elvis, Miles Davis, and Mozart are so frequently at the top of that list, but I suggest a different artist. Does “Weird” Al’s catalog not contain musical elements from every popular form of music (keep in mind he once narrated Peter and the Wolf)? Does it not contain the actual music of songs that were immensely popular? Does that not give some insight into human culture and taste? This notion, of course, is bolstered by the fact that aliens probably don’t speak English and that they’re not too high-brow for fart jokes. "There is an arena in which songs by Lady Gaga, Michael Jackson, U2, George Harrison, and Coolio play on the same field. It is an arena in which their personalities and identities are equalized." That arena, most people under the age of 25 would suggest, is not Weird Al (who is a single musician and not really an arena at all) but the Mashup, Electronic, EDM scene. Do I like Electronic Dance Music or EDM? No, I don't. But I can clearly see that EDM is the future of music because of the very same inclusivity you praise Weird Al for and for its synthesis of disparate musical styles. Now, you won't ever see me at the Electric Daisy Carnival (though I do think Skrillex is pretty snazzy) and I have actually seen Weird Al perform live twice, but we must at least understand that Weird Al is not the only (or really even the best example of) what you are trying to say. EDM is this final arena, in which every form music is truly made relative to one another. I think that this music is kind of horrific where Weird Al is simply funny...but maybe that's the point. You're correct in saying that EDM represents a "synthesis of disparate musical styles", but I would disagree with your assertion that it is an, or--in the case of your argument--the, arena* in which my quoted text is true. At best, I would argue that this happens on a case-by-case basis. Regarding the mashup, the most familiar discography from which I can draw is Girl Talk (I share your sentiments towards EDM, by the way) and I don't see how the analysis applies. Because of the simple fact that the source materials used in his creations share so much elbow room, they are forced to--in a way--compete with each other and retain their identities. From what I gather, there are two enjoyments extracted from listening to Girl Talk: (1) dancing and (2) saying something like, "damn, I never thought I'd hear that Biggie verse over Elton John' music." So in that case, it's because of the original artists' identities NOT being equalized that allows you to fully appreciate (to your capacity) a given song (read: track). *To be clear, I said "an arena" and not THE arena. Additionally, of course "Weird" Al is a single musician and therefore "not really an arena at all" but if you had continued to quote the remainder of the paragraph you'd noticed that I said "'Weird' Al's catalogue", which most certainly is an arena.